Directions: Single infusion mash at 154F (68C) using a ratio of 1.3 quarts water to 1 pound of grain. The 90 minute boil enhances the blood-red color. It also adds a touch more melanoidin and caramel notes. 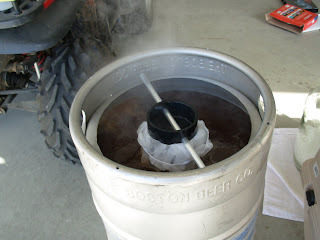 Cool the wort quickly after the last hop addition to retain as much hop aroma as possible. Optionally, dry hop with more Centennial or Amarillo if you’re a real hop monster. Carbonate to no more than 2 volumes and serve at 45 to 55 F (7.2 to 12.8 C). It was an interesting brew day. 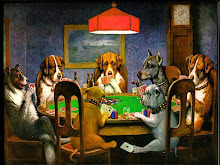 Everything seemed to go well, and then the unexpected happened. See the pics below for details. 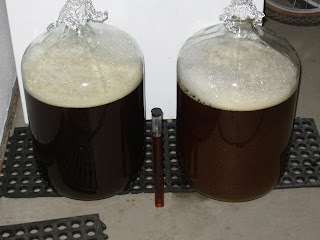 I found a great new place to make the yeast starter: in the garage. 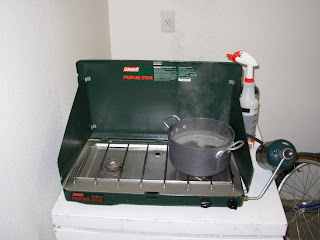 The camping stove works great and the house doesn't end up smelling like beer. 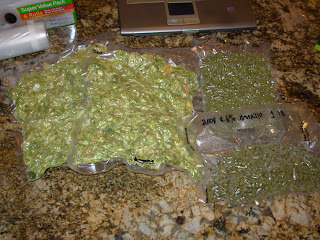 Ten ounces of hops waiting to go into the boil. My new "hopsock" that I built out of a small piece of aluminum dowel, a 3 inch PVC pipe adapter, a 4 inch hose clamp, and a 5 gallon paint strainer. The hopsock goes in the boil, the hops go into the hopsock, and I don't get leaf hops clogging up my ball valve when I'm draining the wort! So, at the end of the boil I put in the wort chiller and noticed that the "in" side had a small leak. No big deal since it's dripping outside the kettle, right? Wrong! 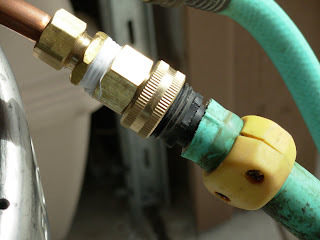 This little gem burst apart spewing water all over the garage but didn't get any in the boil kettle. Whew! Three weeks until fermantation is finished and we can put this lovely elixer on CO2 to carb it up! I needed to seal these up with a vacuum sealer and one of my employees gave me a vacuum sealer that his dad picked up at the thrift store for $2. Not bad since these usually cost anywhere from $40 to $140. 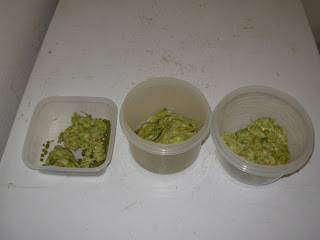 I sealed up the hops today and they smelled wonderful! Unfortunately the Cascades were short 1 oz and the Centennials were short 1/2 oz. I emailed Niko today and let him know what happened. He seems to be a pretty straight shooter so I'm sure he'll make it right. Update: Niko is sending out the hops to make up for the mistake! 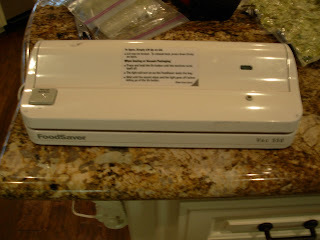 The $2 vacuum sealer that worked excellent!